Fulcrum: A fulcrum is a point of stillness around which motion is organized. Natural Fulcra: In the human body these are points along the axial midline which organise the bilaterally-symmetrical motion of separate body systems. These fulcra are ‘automatically-shifting’, which means they rise and fall with the tide. Inertial Fulcra: Inertial fulcra are introduced by external forces. They are local condensations of potency, fluids and tissues, which act as pivot points for asymmetric motion and strain patterns. These fulcra resist the inherent motion (motility) of the organism and do not move with the tide. Conditional Forces: Conditional forces are the forces of our experience. Also called external, experiential and biokinetic forces. Biodynamic Forces: The biodynamic forces maintain our integrity as we meet external influences. Biodynamic forces are the forces of health and creation. Inertial Forces: The interplay of biodynamic and conditional forces can generate inertial forces in the body. When we talk about inertial forces we are looking at forces which oppose motion. The interplay of biodynamic and conditional forces can generate inertial forces. When the conditional forces of our experience overwhelm our available resources, an inertial force will come into play and compromise the expression of Primary Respiration. At an inertial fulcrum all three forces will be present and will have an effect. Remember that a fulcrum organizes motion. This has deeper implications. Because a fulcrum organizes motion in physiological terms that means it organizes function. There is no function without motion. Because a fulcrum organizes function it also organizes form. For example: A bone is a particular shape because of the function in performs. In physics inertia is a force which opposes motion, it is useful to think in those terms. When we talk about inertial forces we are looking at forces which oppose motion. In physics, a field is a region throughout which a force may be exerted. Examples are the gravitational, electric, and magnetic fields that surround, respectively, masses, electric charges, and magnets. Within the human body, discreet fields of action operate within the greater, unified fluid-tissue-potency field. Natural fulcra organize these fields of action. For example the skeleton, the central nervous system (CNS), the viscera, all have different functions; each system operates in a field with a separate, natural, midline fulcrum. The bony skeleton is said to fulcrum around the sphenobasilar junction (SBJ), the CNS around the lamina terminalis of the third ventricle and so on. These fields of action can be perturbed and distorted by additional external forces. Although each anatomical system represents a distinct field, there is an underlying, cohesive blueprint, which maintains the structure and function of the organism as a whole. We call this the Original Matrix, a term coined by Dr James Jealous (2004). In biodynamic craniosacral therapy we recognize a blueprint or template of health, which underpins our physiology. It is a manifestation of the biodynamic, universal force which Sutherland (1998) called the Breath of Life. We can sense it as a bioelectric, biomagnetic field of light, which permeates and surrounds our physical body. This matrix has an ordering function which persists throughout the lifespan, maintaining cohesion and health. It is responsible for the optimal function of all body systems. It holds the essence of ‘liver’, ‘skin’ or ‘temporal bone’. Unlike the metal framework of a building before it is clad, this blueprint is dynamic, always changing and evolving. The human body is not a structure it is a living process. Our morphology changes moment to moment, hence our body shape is radically different in infancy, childhood, adulthood and old age. At all stages, the cohesion and healthy function of our evolving form is maintained by this matrix. Jaap van der Wal (2008). The activity he is describing is the motion of microscopic particles; a metabolic interchange, which takes place at the cellular level. This activity is ordered by the Original Matrix. An activity implies motion. Lack of motion is pathology. Pathology results from the breakdown of motion. Loss of fluidity and stasis follows. There is a decrease in metabolic flow in the cells involved. In health all cells and tissues display mutability. This ability to change is normal; lack of change is abnormal. It manifests as loss of subtle and gross motion and results in pathology. The Breath of Life maintains a blueprint of optimal health for each unique individual, not an abstract notion of perfect health. Loss of relationship with that individual template leads to disease. For example, cancer can be viewed as an example of cells ‘forgetting’ their identity, ‘forgetting’ how to be lung cells or liver cells. The mutant cells are out of touch with the blueprint of health. Conditional forces are the forces of our experience. The biodynamic forces maintain our integrity as we meet these external influences. Life is a conditional process, you cannot have a life without a body and your body cannot exist without conditions, without experience. A living organism always has an experience of being alive; whether conscious or not. Life can be described as a fluid dance, a dynamic equilibrium between biodynamic and conditional forces. Experience comes with conditional (experiential) forces. Picture a cabbage growing with plenty of sunshine and water and another growing in a draught in poor soil. Each one has a different life experience and each becomes a different plant. There is no such thing as a universal, perfect cabbage, created solely by the biodynamic forces of the Breath of Life. If only the biodynamic forces existed we would all look the same and act the same. Conditional forces are sometimes processed with little change or they can either enhance or overwhelm our blueprint. The stresses of experience can exceed our individual tolerances or threshold resulting in loss of function and inertia. You can see this effect of conditional forces in images of trees growing in different environments. The environmental experience of each tree, such as strong wind or poor soil, literally shapes that tree. The original blueprint of that tree is distorted. Damage to any part of a system will distort that whole field, hence the distortion pattern is apparent throughout the entire tree. You can say that the tree’s biography is discernable in its external form. If we apply this to people, a knee injury will throw the posture of the entire musculoskeletal system out of balance. This will in turn lead to compromises in the vascular, lymphatic and nervous systems. An apparently isolated injury will have an effect on the physiology as a whole. We have seen that the loss of function is a loss of motion. We call the absence of motion inertia. So any dysfunctional structure or location in the body is characterised by inertia and loss of connection to the Original Matrix. Three forces are present at any site of dysfunction: biodynamic, conditional and the force of inertia which resists motion. There is a local loss of motility as forces become entrapped. The conditional forces maintain the new situation while the biodynamic forces centre the disturbance to provide the best possible conditions under compromised circumstances. Together these forces resist motion, an inertial force is introduced. The site where the biodymanic and conditional forces become entrapped is called an inertial fulcrum. There is less potency throughout the system. A lot of energy is bound up in centring the problem hence less is available to the whole energy field. This can be sensed as poor fluid drive, weak Mid Tide or the inability to access a State of Balance. An inertial fulcrum will produce local disturbance in the fluids. Rather than moving with the tide, fluctuations, whirlpools and ripples occur around the fulcrum point. You can visualise this as a rock in a river, which caused the water to swirl and crash instead of flowing smoothly. Because an inertial fulcrum resists motion it distorts the tissue field, causing compression and strain patterns. These manifest as areas of tissue density (local loss of motility) and off-centre dragging motions around or towards the inertial fulcrum. A student once described an inertial fulcrum as a centre of ‘high density health’. This makes sense because at the fulcrum as ‘Bio-energy of Wellness’ (Becker’s term for biodynamic forces, Becker 1997) centres and limits the disturbance. So the biodynamic force is gathered at the fulcrum at the expense of the whole energy economy. 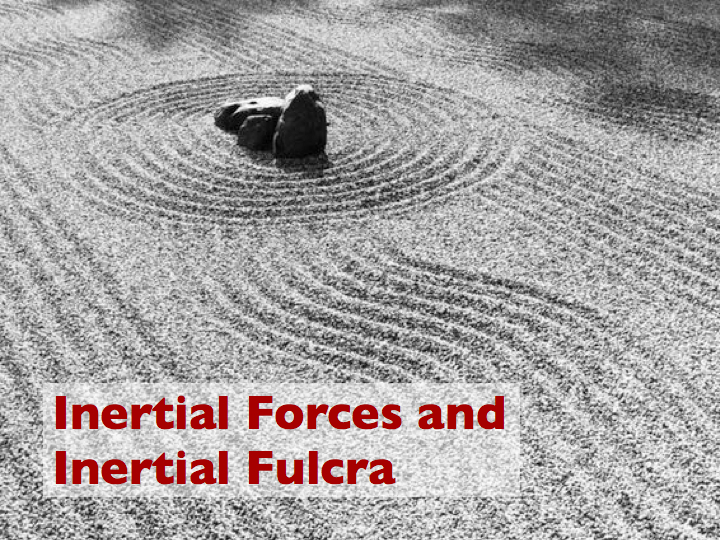 Inertial fulcra generate many of the phenomena we experience in practice, such as one temporal moving more than the other, or fluids swirling around a stiff joint, or pulls in the tensile tissue field. These are all expressions of a loss of motility somewhere in the system so the system no longer moves as a unified whole. Over our lifespan we collect lots of inertial fulcra through physical injuries such as falls; illness, which frequently results in fluid stasis and reduced motility in the affected part, or as a result of emotional and psychological stresses. These fulcra can lock up a lot of potency in their effort to maintain health, leaving the system as a whole, depleted and fragmented. Becker, R. (1997) Life in Motion. Portland, OR: Rudra. Blechschmidt, E. (2005) The Ontogenetic Basis of Human Anatomy: The Biodynamic Approach to Development from Conception to Birth. Berkeley, CA: North Atlantic Books. Jealous, J. (1994) Around the Edges. Bradford on Avon: The UK Sutherland Society. Sutherland, W.G. (1998) Contributions of Thought, 2nd edn. Fort Worth, TX: The Sutherland Cranial Teaching Foundation, Inc.
van der Wal, J. (2008) Lectures and workshops. London. Organised by CTET. « The book is out!